The ASC Spring Convention & EXPO was held April 18-20, 2016 at the Hilton New Orleans Riverfront. This three day event brought together over 560 industry professionals for concurrent technical sessions focusing on business development and market trends, government relations issues, and advanced technology. The EXPO was held on Tuesday, April 19th and featured 90 exhibitors, the largest ever! 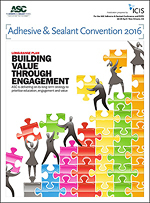 The Adhesive and Sealant Council's 2016 Spring Convention & EXPO is expecting more than 550 industry leaders from all levels and departments of large and small adhesive and sealant manufacturer and supplier companies worldwide. The attendee profile consists of upper level management (CEO/VP), technical/R&D, sales & marketing, plant operations, and business development. This is the largest gathering of adhesive and sealant professionals in North America and should not be missed. Call for Speakers is now CLOSED for Spring Convention. However, the Adhesive & Sealant Council (ASC) invites you to submit a presentation proposal (abstract) for inclusion in the ASC 2016 FALL Convention program. All timely subject matter and topics relevant to the adhesive and sealant industry will be considered. IMPORTANT UPDATE: The Hilton New Orleans Riverside is now SOLD OUT. Important: ASC works directly with the hotel and does not work with third parties working on behalf of the hotel and/or the Council. Be sure you use this booking link or contact the hotel directly to make your hotel reservations. The group rate is available until 5:00 p.m. EDT on Monday, March 28, 2016. Reserve your room as soon as possible as the group rate will not be available if the ASC room block sells out prior to the deadline. Reservation requests received after March 28, 2016 will be charged standard rates as rooms are available. If you contact the hotel directly at (504) 561-0500 to secure the discounted group rate, please mention that you are attending the ASC 2016 Spring Convention & EXPO. ASC kindly asks that you only reserve the number of rooms you need, so other attendees will not be turned away because the ASC hotel room block is full. We appreciate your consideration. The ASC Spring EXPO will be held on Tuesday April 19, 2016 from 3:30 to 7:00 p.m. The EXPO is the industry's DIRECT ACCESS to the leading suppliers, technologies and solutions in the adhesive and sealant market. This year's Spring EXPO continues to expand! This is your company's chance to showcase its products and services to buyers and decision makers, network face to face, share information and discuss the latest technologies. The EXPO allows you to CONNECT with the industry. With exclusive "EXPO Only" hours and traffic builders, such as an Exhibitor Appreciation Reception and door prizes, the exhibit hall is an effective and efficient way for companies to market their products and services to a targeted audience. Click HERE to visit the EXPO Exhibitors page and reserve a booth. You can review/download a copy of the exhibitor contract and exhibit opportunities HERE for a copy of the exhibitor contract and exhibit opportunities. Involving your company in pre-convention and onsite promotion can increase visibility and market recognition while demonstrating your support of the adhesive and sealant industry. Click HERE for available sponsorship and advertisement opportunities! Co-located with the convention & EXPO is a two day Hot Melt Short Course being held April 18-19, 2016. This course will feature 12+ expert speakers covering formulation strategies, based on application and performance requirements for a variety of hot melt adhesive markets by industry experts. Participants will learn how plasticizers, tackifiers and waxes are used to enhance base polymers for optimized processing and properties and how to evaluate the mechanical and rheological behavior of hot melts and resulting bonded assemblies. Learn more about the short course HERE. Please join ASC staff and ARIZONA CHEMICAL as we give back to the community of New Orleans! When: Monday April 18th from 8am until 2pm. Register your team HERE and help us show New Orleans how the Adhesive & Sealant industry comes together to serve the communities we visit! For those that cannot make the Monday arrival, we will likely have a second community service project onsite at the conventions. More information to follow in convention email updates. Located just 20 minutes from downtown in the New Orleans East neighborhood, the mission of Einstein Charter School is to promote academic excellence in teaching and learning through the integration of mathematics and science in interdisciplinary curricula and to promote the ideals and habits of lifelong learning among all stakeholders. Einstein Charter is an open admission, tuition-free Pre-Kindergarten through 8th grade school that operates three campuses which serve 909 students ages 4-14 years old. The student body reflects the diversity of New Orleans East (59% African American, 23% Asian, 17% Hispanic, 1% Caucasian) and services are offered in English, Spanish, and Vietnamese. 91% of students qualify for free or reduced lunch. A majority also qualify for the free dinner meal program. Twice in recent years, Einstein Charter Schools has managed to turn a failing public school into a successful place of learning for their students. After inheriting two F grade schools since Katrina, Einstein has been able to take them to a B performance grade in only a single school year each. Their newest campus, Sarah Towles Reed High School, is the chance to benefit even more children by vastly increasing their access to a quality public education in New Orleans. Volunteers are a critical part in preparing the school building and campus for this important next step! - Landscaping, tree-planting and beautification projects throughout the entire campus!